The Cnidarian, Hydra is familiar to us from Greek myths and as a tiny, freshwater inhabitant. Despite their lack of eyes Hydra magnipapillata have been known to respond to light and now research has found out how. Work such as this is not distinct from work on humans or other seeing organisms. We apparently have the same opsin light-reacting chemical and most likely have the Hydra as a distant ancestor! The research on such simple creatures might be thought to have found all there is to know, but David C Plachetzki and the other authors at the University of California (both Davis and Santa Barbara) express concern that more is yet to be learnt on the sensory reception of their cnidocytes. The cnidocytes are key to this paper in BMC Biology too. 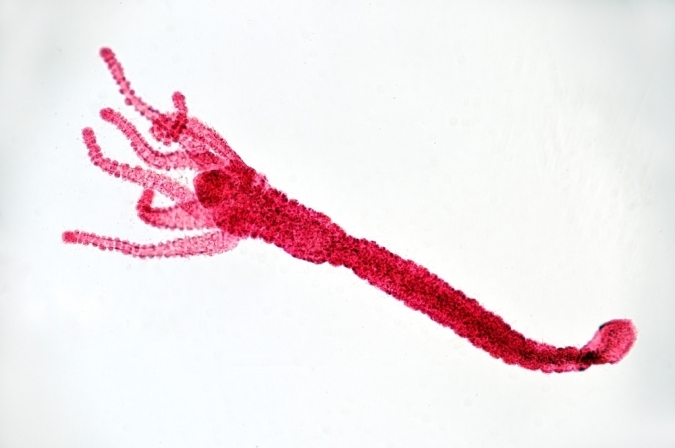 They are the classic stinging cells of all the jellyfish and corals, as well as this Hydra, actually the species, Hydra magnipapillata. They have been known to react to chemicals and physical effects on their "trigger" for many years. In this case the stings are fired in response to light intensities, which are determined by the opsin. The opsin reacts to light just like the rhodopsin in our retina. Dr Plachetski explains, "Not only did we find opsin in the sensory neurons that connect to cnidocytes in the Hydra, but we also found other components of photo-transduction in these cells. These included cyclic nucleotide gated ion channels (CNG) required to transfer the signal and a hydra version of arrestin, which wipes the photo-transduction slate clean for a second signal." Complicated though the chemistry is, it explains that the animal is close to the functioning of some retinal sensory chemicals. The use of the opsin light detection system is to regulate the capture of water fleas (Daphnia) on which the Hydra feed. The nerve net it uses to integrate its simple, brainless behaviour can cause it to move to the area where Daphnia gather to feed at the surface, then fire off its stings to hold and trap them. How the organism uses the light information in order to fire upon prey is intriguing. Light information could be used to deploy stings for defence or aggression, given that high light intensities depress the firing of stings. Certainly wastage of energetic cnidocytes could be avoided. Feeding is tuned to a dim light regime such as at dusk. Shadows could cause firing within milliseconds, as a prey item (or predator) overshadows the Hydra. Other uses of opsin to inhibit cnidocyte cells are also suggested when the Hydra somersaults in order to move to a different location. It is possible that the significance of this opsin research is felt most clearly in eye evolution. This most ancient of multicellular animals has similar chemicals to the Chordates (eg. ourselves.) Some of its members developed very simple eyes, meaning that the Hydra could have the ancestral light reception system that its more "modern" relatives developed as optical structures.